A look back at some of Kailua’s most evocative places. Some of the images featured in this article will be in a forthcoming book on Kailua, published by the Kailua Historical Society. Special thanks to Barbara Pope Book Design. The view from Alala point towards Lanikai, circa late 1920s or 1930s. PHOTO COURTESY OF ERLING HEDEMANN, JR.
Across the street, roughly where McKenna Ford stands today, the old Kanetake Garage presided over the town’s inbound traffic for decades. Well into the 1950s, dairy cows grazed in the field out back. Arby’s and the Firestone store have replaced the theater. But the careful observer will note a familiar triangular median in the roadway. The iconic banyans? They’re visible in the old photo; barely visible against the white of the movie house, you can make out the first sapling against the white of the movie house. A couple of months ago, a reader wrote in to the local paper asking if anyone knew the recipe for Boston cream pie from the old Jean’s Bakery. The memory of desserts is a persistent one. 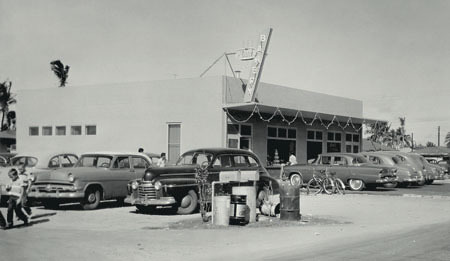 Jean’s Bakery (seen here in December, 1955) was a Kailua institution, but it’s been closed for more than 30 years. In a photograph dated 1951, the bakery staff stand behind a gleaming counter in the original store in the back of the old Piggly Wiggly store on Oneawa. In 1955, George Abe, the owner, bought the lot across the street on Uluniu. He built his home in the back and a new bakery and soda fountain in front. There, the Abe family continued to sell cakes and pies and fountain drinks for nearly another 20 years. PHOTO COURTESY OF ERLING HEDDEMANN, JR.
For nearly four decades, the Kailua Tavern, on the corner of Oneawa and Kuulei, served as the town’s only real night spot. According to longtime Kailua resident Erling Hedemann, “People came to the tavern all the way from Honolulu. They say that scurrilous cowboys tied their horses out front—and I include my scurrilous brother in that group.” Despite the cowboys, there was a genteel side to Kailua Tavern, too, which also had a restaurant and a dance floor. Alberta Hussey, once the vocalist with the Gigi Royce Orchestra at the Royal Hawaiian, sang at the Kailua Tavern with the Audino and Allen Band after World War II started. 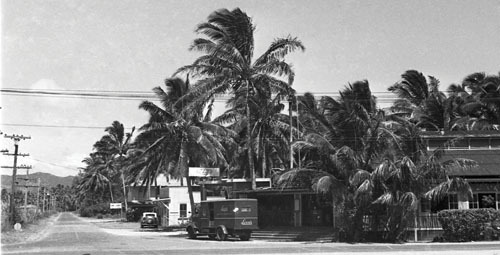 By then, the tavern was known as the Coconut Grove Inn. 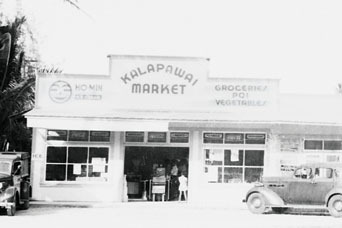 Kalapawai Market has catered to the residents of Lanikai and along Kailua Beach for more than 70 years. The original owner, Richard Wong, knew what his customers needed, and developed strong loyalties among them. When Maurice Sullivan built the first Foodland nearby, some residents were excited to finally have a real supermarket in the neighborhood. Others, though, were alarmed. Peggy Bredesen, whose family has lived on the ridge above Lanikai since 1931, notes that they could see the great domed structure over the treetops. “It was the biggest eyesore,” she says. More importantly, they were concerned that the new supermarket spelled the end of their old friends at Kalapawai. But you should never underestimate the power of customer loyalty. Ironically, although Sullivan went on to create a Foodland empire, at this location it faltered. The Kalapawai Market, under the new ownership of Don Dymond, flourishes still. 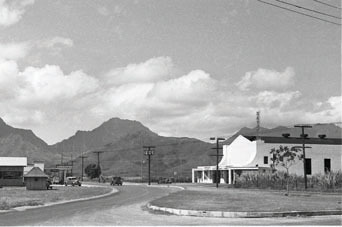 In the 1930s, when downtown Kailua was still mostly watermelon patches, the area’s population center was farther up Kailua Road, among the taro fields and rice paddies of Maunawili. 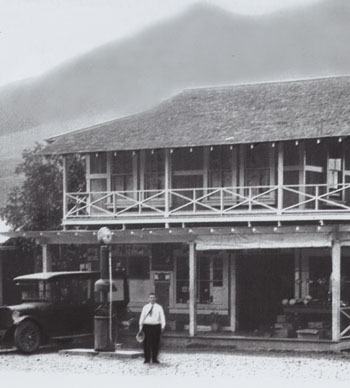 During this era, the Matsuda Store, near the Waimanalo junction on the old Pali Road, served as the Kailua store. Area farmers visited for everything from gasoline for their cars to feed for their livestock. Even after the Matsuda Store closed, the building—now a part of Kaneohe Ranch—remained stand-ing alongside a dead-end fragment of the old Pali Road behind Castle Hospital. Martin Knotts, whose Diamond K Ranch still runs about 60 head of cattle along the fringes of Kawainui Marsh, lived in the old house for its last 20 years. “In June of 2000, I finally had it torn down,” he says, “because the termites were in there so bad, and I couldn’t get a long-term lease.” Today, though the state now owns the land, Knotts still lives in a trailer right behind the foundations of the old Matsuda Store. Only a small concrete plinth, a remnant of the old gas pumps, gives any clue to the store’s former location. The row of churches along Kailua Road has an air of permanence. It’s the nature of churches. 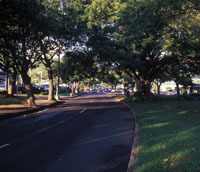 But, for most of its history, this section of Kailua was agricultural. Around the 1920s, Issei farmers began to grow fruit and vegetables and chickens in farms along Kailua Road. Their children, because their English was better, sold the produce from popular roadside fruit stands. The most successful of these was the Kailua Fruit Stand, owned by the Nishikawa family, which stood about where the First Presbyterian Church is today. Kinji Nishikawa and his wife, Some, grew avocados, papayas, grapefruit and vegetables. Sandy Kimura, their granddaughter, says famous people, like Duke Kahanamoku, used to come from town to visit the fruit stand. “John Burns came every Sunday, before he was governor,” she says. But, around 1959, the Nishikawa lease expired; and, after 25 years serving Kailua, most of the farm was bulldozed to make way for development. According to Kimura, though, you can still find a few of the old Nishikawa fruit trees strewn through the Kukanono neighborhood. Amii Kahikina, whose Amii World Travel Agency on Oneawa occupies a plot of land that’s been in the family for nearly 70 years, remembers that Boston cream pie. “It was like sponge cake with powdered sugar on it instead of ganache.” Today, the old building has had an addition at the front, and houses a new “old institution”: the Chinese Garden restaurant. But the square outline of Jean’s Bakery is still discernible in the L-shaped building, and old-timers passing by on Uluniu sometimes still find themselves craving that Boston cream pie. Dennis Hollier grew up in Enchanted Lake and writes frequently for HONOLULU Magazine.